The Vice President of India, M. Venkaiah Naidu said that India must equip farmers with knowledge, insights and products. He was addressing the Valedictory Session of the One Day State Level Workshop on Biodiversity and Sustainable Agriculture for Doubling of Farmer’s Income” organized by the Government of Manipur and the Central Agricultural University, in Imphal, Manipur on wednesday. The Governor of Manipur, Dr. Najma Heptulla, the Chief Minister of Manipur, Shri N. Biren Singh, the Minister for Agriculture & Animal Husbandry, Shri V. Hankhanlian and others dignitaries were present on the occasion. 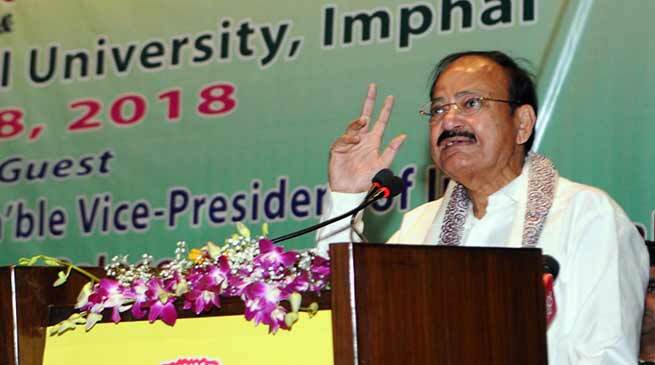 Vice President said that water conservation is crucial for sustainable agriculture, and said that there is an urgent need to conserve resources. He further said that, in his view, not only should we construct ponds for water conservation but also convert these artificial water storage structures into active fresh water ecosystems which in turn will be biodiversity spots for the aquatic wealth of the state, he added. The Vice President said that global warming is real and is affecting our lives in every way. He further said that it should be our endeavour to sustain the agricultural production by mitigating the effects of global warming while conserving the biodiversity in ways that are sustainable. You must ‘dialogue’ with farmers, ‘discover’ new products and practices and ‘disseminate’ new insights and knowledge for development, he added. The Vice President said that agriculture sector needs a big boost in India and efforts are needed to make it sustainable, economical and attractive. We need to focus on the farmer’s incomes as well as on the farm productivity and long term environmental sustainability, he added. The Vice President said that best practices from the traditional farming with the latest know-how can play vital role in improving productivity in agriculture. He further said that apart from intensification of agriculture, we must go in for greater diversification. Farmers should be encouraged to go in for a greater variety of alternative crops like high value fruits, vegetables and medicinal plants, he added.